MyMemories Blog: It's the *Cinco de Scrapo* Wednesday Challenge!!! It's the *Cinco de Scrapo* Wednesday Challenge!!! It's the start of our party to celebrate NATIONAL SCRAPBOOKING DAY and CINCO de MAYO!!! So this week, we are offering up FIVE fun theme/challenge ideas so EVERYONE has a chance to enter!! You can use ANY of the ideas for your page! AND the coolest part...? have them join in on the fun! We don't want ANYONE to miss out! Here are the FIVE theme/ideas for you to start with - use ANY MyMemories kit/Designer to enter!! The number FIVE - 5th birthday, 5th anniversary - if you have 5 kids, you are totally set! Of course it's NATIONAL SCRAPBOOKING DAY - so any scrap event, or get together! and because the BLOG TRAIN's a-comin' - any TRAIN themed page is IN there too! So that should give EVERYONE something to work with! Remember you can use ANY MyMemories kit or Designer, but you MUST get your page posted HERE USING THE LINKY TOOL! ... and don't forget to make a memory today! Very nice job, Lisa. My Memories, I'm following on this blog now. Hope you'll follow on my blog. That helps me to get back here. 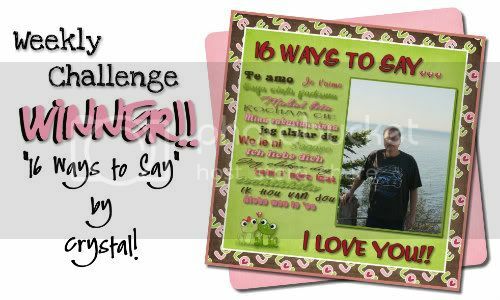 Thanks for the giveaway at Give oh Giveaway"
What a fun challenge! Thank you for the chance to win such a great prize!